Um...yay! New submission! My first iPod spoof; been meaning to do one for a while. Although I'm not possitive if iPod spoofs won't be deleted :sweat: On theotaku.com, I'd seen a bunch of iPod wallies for furuba...but they kind of sucked XD ... so I made my own! In case you couldn't figure it out, the one on the left is Yuki Sohma and on the right is Kyo Sohma. good job ^^ i like how u used orange for kyo and purple of yuki. Look, i like it a lot really, it's the first ipod furuba wallie that i see here at MT. But i think you should put just one color, not two (but i mean the purple for yuki and orange for kyo) or at least make them look stronger. lol, I think this is one of the more creative iWalls I've seen, because it actually features two characters instead of one. iHate XD love the title! Great! It shows that you put alot of effort into it! Great job, and keep up the good work! wow, this is awesome. Great job! 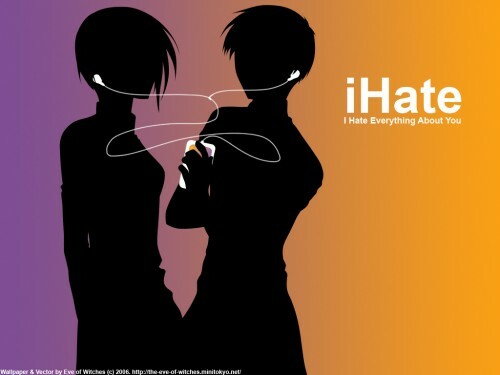 I love those one with an ipod! Woah! Is great, and their iPod form are really well done!